How to organize your life with Trello. Trello is the best tool to get organized as a busy mom. It’s 10 pm on a Tuesday night and you just remember that you were supposed to make 3 dozen cookies for your kid’s school party. Or maybe you’ve been here. You have to start planning for your family’s big vacation and you’re overwhelmed with creating an itinerary, don’t know where to start with packing, and when people ask how they can help, you aren’t even sure what to assign them to do. As moms we have a million things to remember at all times, our brains are always on the go and we live with never ending to do lists. We write things on random slips of paper, post it notes with reminders fill the fridge, and the lists for school and spots get lost in the shuffle of everyday life. Instead of continuing to buy different planners hoping to ‘find one that works’ (but instead allowing them to pile up and create more clutter), how about trying something different? Something that can allow you to get all of those thoughts out of your head and onto a digital system that you can take with you anywhere, share with your family easily, and allow you to FINALLY feel in control and less stressed? Trello is a life saver for the busy mom who needs to juggle everything! With Trello, you can set up boards that you need and customize cards with checklists, to do lists, labels and more! Oh, and did we mention that it’s FREE! Yup, no more buying planners or needing to spend money on a million apps. Trello is your one stop shop to getting your family and life on track! Creating a board is super simple but, to save you time, we’ve come up with a list of 101 Trello Boards you can create to make life easier! We’ve included boards to help you organize the kids chores, babysitter information, important photos, your budget AND MORE! It’s super easy to COPY a board and, once it’s copied to your Trello account, you can customize it however you see fit! Check out this video to see how you can easily copy any board and get a sneak peak at the board list! 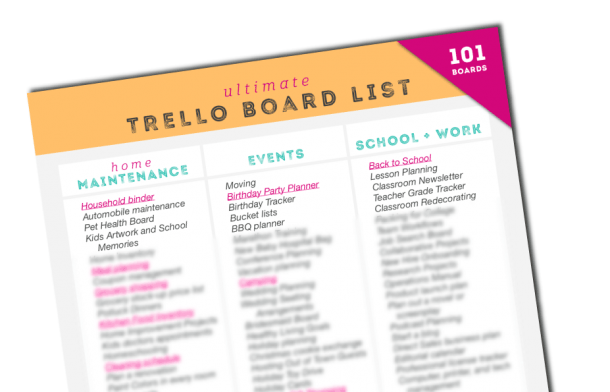 Here is our list of 101 boards that can get started with your love affair with Trello! If you don’t have a Trello account, it’ll prompt you to create one for FREE when you go to copy the board! ...and finally organize your life! If you want to get moving with your boards, drop your email and we’ll send them over to you! You can print it (or better yet, attach it to a Trello board!) for future reference, and snag any of the boards we’ve already made for you! 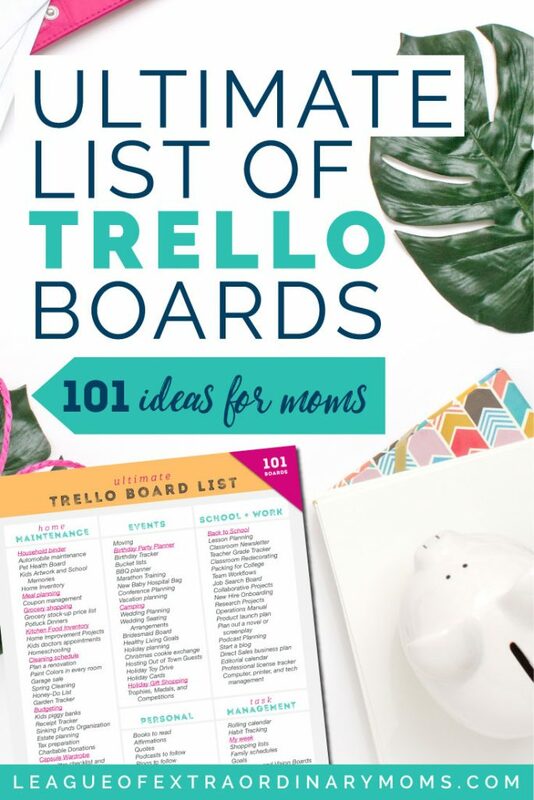 What types of Trello boards have you made? Let us know in the comments and make sure to SHARE this post if it helped you and PIN It to come back to later! I am currently following your Trello course and I love it. The lessons are easy to follow I have come round to using Trello very quickly. I am not normally a tech person and prefers paper but Trello is so versatile it is a dream. I have already built a few boards to replace some of my main lists and I like that you can link to google calendar for planning. It’s great to have everything in one place rather than all my bits of papers stuffed in an agenda for to do lists, meal plans, cleaning schedules, shopping lists and all the organising I need to get done. It is a great tool to coordinate all the family (my children are old enough to use it too). Thank you for the course and for the list of board ideas. I’m so glad you’re lowing it! Keep us updated!